Every two years the Wairarapa Vintage Machinery Club organises this popular event, with working vintage machinery, lots of other displays, markets, food and more. 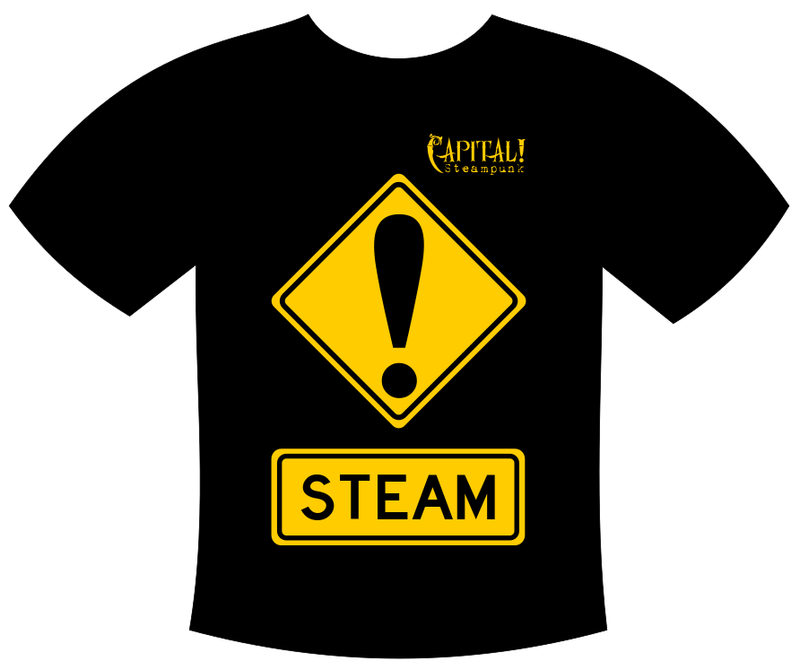 Our friends at Wai Steam are going, and Capital! Steampunk members are welcome too. The event runs over both days of the weekend from 9am to 4pm at the Clareville Showgrounds – just north of Carterton on Chester Road, if you’re coming from Wellington. One of the highlights will be the harvesting of a specially planted wheat field. The harvesting, threshing and milling will all be done by vintage machinery. Draft horses will harvest a wheat crop with a binder and a Clayton Shuttleworth mill will be working. 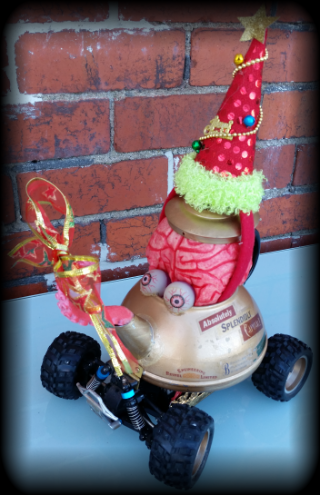 We may be able to do a gentle teapot racing demonstration, so bring your pot along – you have got your teapot ready for CubaDupa, haven’t you? Otherwise, we’ll enjoy the opportunity to promenade, have photos with the marvellous machines and catch up with Wai Steam. The best bit? If you come along in steampunk costume, you’ll get in free! On teapot racing day, don’t run out of steam. Use fresh batteries, or if your vehicle uses rechargeables, make sure they’re fully charged the night before. And don’t forget about the batteries in the controller as well. That should get you going in the right direction. Watch here or on Capital! Steampunk’s Facebook page for registrations to open and we’ll see you at CubaDupa. Join us for our first 2018 event at the Embassy Theatre in Kent Terrace on Saturday 6 January at 5.45. This film is one we’ve been keeping our eye on as a Capital! opportunity for splendidness and tells (with some artistic licence) the story of P. T. Barnum – creator of the Greatest Show on Earth. Come along in full steam, part-steam or your new Capital! Steampunk t-shirt – whatever you’re most comfortable in. Book your tickets here – as a bonus for online bookings, this is the Embassy’s Movie of the Week so tickets are only $10 if you register with them. Otherwise buy them at the door. It’s the 6.15 session, but come early and meet us in the Black Sparrow bar under the Embassy before the show starts. Some of you will know we acquired a splendid two-metre statue of Queen Victoria a while ago. She was a little worse for wear then, and she became a little more so as we tried to get her out of the building she’d been in! Our wonderful sculptor Kim is now giving her some TLC, and we’re also going to have to work out where to keep her (Her Majesty, not Kim) and how to transport her to our various outings. That will probably require money and Capital! 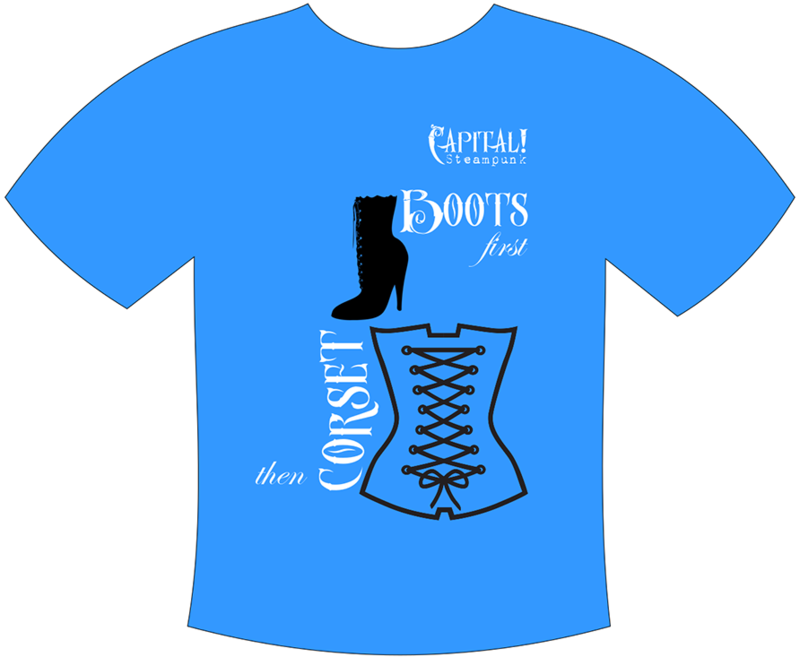 Steampunk’s income is somewhere between zero and tiny, so we’ve produced a range of t-shirts to help raise some funds. There are three designs (click the images to see bigger versions). The first was inspired by spotting a garment bearing the legend ‘Less is more’. 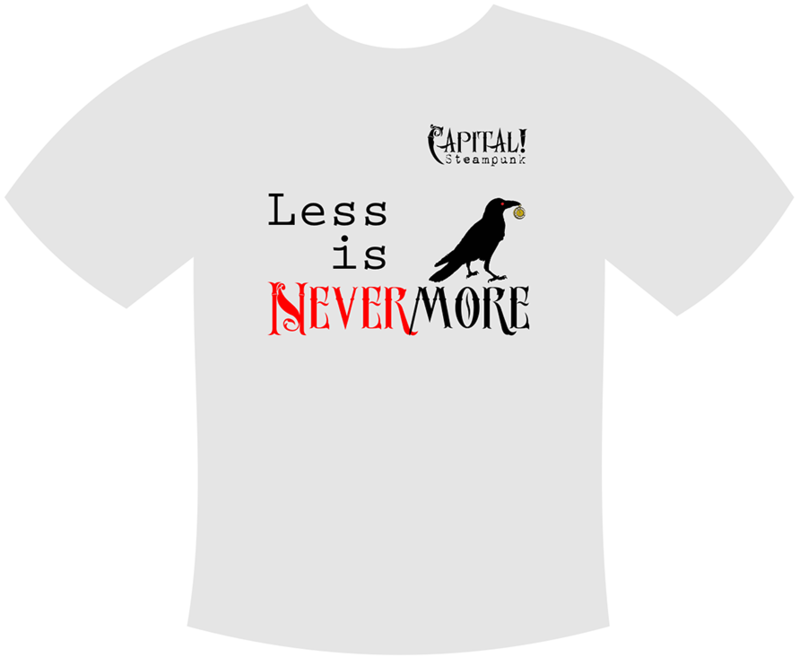 As steampunks, of course, we could never subscribe to such a philosophy, so the idea was born to combine its opposite with a reference to Mr. Poe’s raven, printed on a light grey shirt. The second design reproduces a road sign seen on State Highway 1 at both Wairakei and Taihape. We feel this one looks best on a black shirt. And the third is a valuable reminder of a trap a number of steampunks will have fallen into. This is on a nice blue – the colour you see here isn’t exact, but it’s close. The first run of the shirts has now sold out, but never fear – we’ll look at putting a second order together early in 2018. We’ll post a proper order form then, but contact us in the meantime if you’d like to register your interest. This year it’s on between 11am and 3pm on Saturday 25 November and admission is by gold coin. We don’t bother with meeting times and so forth; just come along in your finery and we’ll find each other. Homewood, at 50 Homewood Avenue in Karori, is a lovely old house with delightful grounds to explore. The weather is sounding quite propitious at this stage, so we’ll look forward to seeing you there. A very splendid ho ho ho to all our Capital! Steampunk followers. The Johnsonville Christmas Parade will be on Saturday 2 December. Sir Harvey Lampoon has offered the use of his finest dirigible (or perhaps truck) to use as a float, and we’d love to see as many steampunks, goths, cosplayers or others as possible joining in. The parade assembly area is along Dr Taylor Terrace in Johnsonville – the vital piece of information to know is that Capital! Steampunk’s parade number is 36 (write it down now, or make a note in your aetheric communication device). Mention that number to anybody who looks official and they should be able to direct you to where the rest of us should be. Note that there’ll be no parking on Dr Taylor Terrace or Frankmoore Avenue on the day, so arrive in good time if you need to find a park. We’ll be getting together at the assembly point from 10am. The parade will move off at 10.45 and will go from Dr Taylor Terrace to Broderick Road, then to Johnsonville Road, Moorefield Road, Frankmoore Avenue and back to Dr Taylor Terrace. Wear your most splendid outfits and come along prepared to smile, wave and make noises (kazoos, bells, drums, etc. are highly encouraged). Racing teapots are welcome to accompany us – just be aware that if your teapot’s battery runs out you’ll probably have to carry it. If the weather is nasty the parade will be cancelled – there’s no alternate date. Cancellation notices will be on The Breeze and NewstalkZB, and we’ll try to put something up here if we find out in time. But our experience is that it almost never rains when Capital! Steampunk is out and about, so everything should be marvellous. The Wairarapa’s first steampunk art exhibition is on between 25 September and 23 October at King Street Artworks, 16 Queen Street in Masterton, but Sunday 15 October is a special day for steampunks from around the region to get together, view the exhibition and workshops and indulge in a bit of Splendid Teapot Racing. Brass & Glass Photography will also be there, offering the opportunity to have our photos taken by a traditional wet plate technique ($45 per photo). The day runs between 10am and 3pm. Come along in your best steampunk promenading outfit. It’s been a while since we headed over to Greytown’s renowned Cobblestones Museum, so here we go again on the Saturday of Labour Weekend between 10am and 3.30pm. This will be a fun family event, with free entry, pony rides and egg-and-spoon and sack races for the kids, plus a tug of war, a pie bake off, vintage crafts and devonshire teas (and of course the opportunity to look around the displays of Wairarapa history and vintage machinery). Bring cash for food and drink, etc – there’s no eftpos. And be sure to dress up for your vintage photograph! A good steampunk swanning opportunity to mix and mingle in the Wairarapa, and it’s entirely possible there could be a spot of tea duelling if you’d like to try it out. Spring is here (we hope) and it’s over the hill to Featherston to meet up with our Wai Steam friends for another miniature train carnival. There’ll be train rides, market stalls, demonstrations and a great display of model trains and layouts. Plus, of course, that thing we do so well called Splendid Teapot Racing. The carnival is in Clifford Square in Featherston and runs from 10am to 3pm on Saturday 2 September. Come along with a picnic lunch, your best racing teapot and of course your most splendid train-riding attire. Have a look at the official brochure for more information. Photographers Brian Scadden and Jane Fletcher are coming to Wellington on Sunday 30th July to take our photographs using traditional Victorian photographic techniques. You can see your photo develop before your eyes out in the daylight. This event is for steampunks who wish to have their photos taken in full steam or Victorian/Edwardian dress. You get an original tintype photo, an electronic version to keep and an amazing experience, just for $40 each. The photographers Brian and Jane are available between 10.30 am and 3pm. The process is leisurely and cannot be rushed. We will have a friendly BYO shared picnic in a beautiful home while we wait our turn, watch the photo process and socialise. Contact us to confirm and indicate how many people will attend and we’ll let you know the address in Khandallah and a guide time for the photo session. Numbers are limited. You can hear more about the technique here.